BRIDGETOWN, Barbados, May 24, CMC –Prime Minister Freundel Stuart cast his ballot in the St. Michael South constituency on Thursday acknowledging that there is “heightened expectations” in Barbados on the part of both the ruling Democratic Labour Party (DLP) and the main opposition Barbados Labour Party (BLP). An estimated 255, 654 voters are eligible to cast ballots in the general election that is being held more than a month after the parliament here was automatically dissolved. Stuart, who led the DLP into a 16-14 victory in the 2013 general elections, told reporters that he is aware that many Barbadians had come out to exercise their franchise and that “based on the reports I have received all the constituencies have seen a lot of activity. 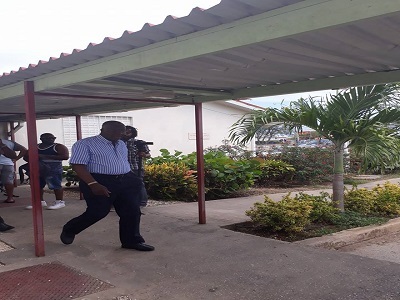 “So far we seem to be having a peaceful election,” he told reporters after casting his ballot at Bayleys Primary School in St Philip, south of here. “The contest between the two major parties has been a very hot one. This election was being looked forward to for some time. I think there is heightened expectation on both sides of the political divide. I certainly have in every speech I made in the campaign emphasise the importance of not staying home and therefore if there are long lines and people are coming out to vote that’s a welcome sign. “It shows our democracy …is in good nick,” Stuart told reporters, adding that he thought there had been a good election period, making reference to the four week of campaigning. He acknowledged that “people express themselves vigorously and take a very strong position on behalf of the political party they support, but it never transcends the perimeter of decency and therefore our elections are very peaceful and the campaign a peaceful one,” he added. “All the parties contested themselves I thought properly,” he said. Stuart’s main challenger for his post, Mia Mottley, is due to cast her ballot later on Thursday. BRIDGETOWN, Barbados, May 24, CMC – The leader of the main opposition Barbados Labour Party (BLP), Mia Mottley, says Thursday’s general election will determine the future direction of Barbados. 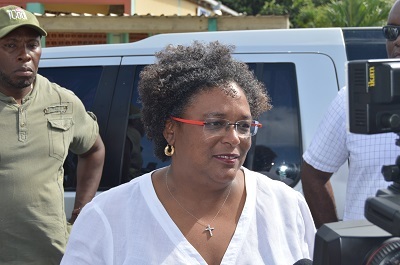 Mottley, who is seeking to become the first woman to become prime minister here, told reporters after casting her ballot in the St. Michael North East constituency, said she wanted to “thank Barbadians for heeding our call and coming out in their numbers. “We are satisfied that they have done that, there has been a lot of passion on the part of people for their country,” she said, adding “it is the most significant election since independence and that this election will determine the direction of our country whether there is a new dawn or we continue or we continue along the current path”. Mottley reiterated as she has done throughout the campaign that the state of the Barbados economy would be a priority for whichever party emerges victorious in Thursday’s general election. While there are candidates from seven political parties contesting the 30 seats in the Parliament, political observers say the race is a straight contest between the BLP and the incumbent Democratic Labour Party (DLP) headed by Prime Minister Freundel Stuart. She said that last 10 years of DLP rule can be described as “the lost decade” adding “we are satisfied voters…do what is necessary to come out and vote”..
She said despite hiccups “Barbados has a tradition of being orderly and we want to maintain that as far as possible,”’ she said, adding that the party is using the proper legal channels to ensure that names that had been removed from the list are reinstated. “More than anything else I want everybody to remain clam,” she said. Mottley said that she remains confident, adding “what we saw this morning (turn out) is nothing short of phenomenal”. “The Barbados Labour Party will emerge victorious because I genuinely believe we have the party with the better plan, the best team and that has been anchored and focus on the issues rthat the majority of Barbadians want in this campaign,” she added. In the last general election, the DLP won by a slender two seat majority. And that was for a second consecutive term.